I left to go to Madrona with two projects in my bag. Well, three. I had a sock with me just for the sake of security, but I had no real intentions of knitting it – which definitely wasn’t the case with the other two. I took with me the do-over of Elliot’s little sweater, and I swear to you that I had every intention of finishing that straightaway. I only took the yarn for the second Bonfire cowl with me in case I finished that sweater super quickly and needed a backup project. Oh, sure – I mean, I started the cowl in the lounge on the way to Madrona, but that was just for the flight. I wasn’t really going to knit it all weekend – not when Elliot needs a sweater. * In a practical sense, it made sense to knit the cowl on the plane. Circular needles, nothing to drop, no notions required, no interruptions while I established the pattern. Start the cowl on the plane, then put it away until the sweater was finished. Completely responsible choice. Once I landed, I was super busy teaching and organizing, so I just grabbed the bag with the cowl, because the sweater was in my suitcase. For three days. Fine. The sweater was in my suitcase for five days and I had a lot going on, and it simply was not convenient to bend over for a moment and pick it up because I LOVE KNITTING THE COWL. *It’s okay, he has more than one knitter looking out for him. Ken just finished one, so it’s not like he suffered for a moment. **Please refrain from noticing that this is the point at which I set the sweater aside. Thanks. That face makes my week! This is so totally the way I work. This is why I’ve got a cabinet full of beautiful lace shawls, and no socks despite a container full of yarn and sock patterns under my bed. He makes such a beautiful model. Love the cowl!! That was just your subconscious telling you that after knitting sooo much of that grey yarn, you really needed to knit something in beautiful colours! Agreed! Especially if it was wet at Madronna. What a happy looking recipient of a hand knit sweater! Elliot looks wonderful in his Rocketry – and glad to see he has several knitters looking out for him. Go Ken! I absolutely love his wide grin of delight! Truly a kintworthy little chap. Elliott is cuter every day! That baby is going to drown in wool. I don’t think you need to worry about him keeping warm! Beautiful cowl (your kinda colours). Is it me or do you have to tink back a few rows according to my glasses? LOL! Better to know now. That little baby is bordering on toddler in that picture. Totally hearts-for-eyes emoji! I get seriously wistful when blog babies grow up before my eyes. Maybe you should put him in that too-small sweater and keep him pocket-sized just a leeetle bit longer. Ah, life when knitting grabs us by the needles and refuses to let go. Enjoy your cowl monent; you deserve to knit for you too! And awesome colors for Eliiot, Poppa Ken! …but you’d better get started on Elliot’s gansey. Ken was smart and made the sleeves on his sweater extra-long, but they won’t stay that way for long. At the rate Elliot’s growing, he’ll be trying out for the NBA next year! 2) Elliott, PLEASE stop growing an inch a day. Wondered if anyone else had thought, “She’s not called the ‘YarnHarlot’ for nothing.! 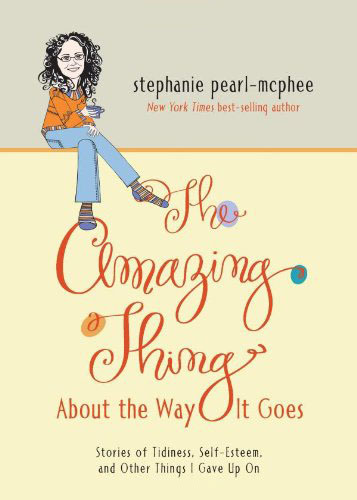 I (like some others here) use Steph as justification for my own yarn fickleness, so it is always good to read about! Please ask Ken to pop over and explain the cool border treatment on the cardi— looks like a vertical Latvian braid but I can’t tell. And when did Elliot get so baby teeth?! Meg might want to think about making you another newborn since this one seems to have changed so quickly! Hilarious! Brioche just seems to take a hold doesn’t it. The cowl looks awesome as does your grandson. I understand perfectly! How adorable is your grandson, Elliot! So darn cute! Watching (adorable) Elliot get older is so bittersweet for me, because he’s about 2 weeks younger than my little guy (we saw you at Madrona, actually, but only briefly amidst the general whirl). So every time there’s a new (adorable) photo and I think “oh gosh he’s getting so grown up!” I’m forced to realize… so is mine! All the heart pangs. Suddenly you look at them and they’re more like little boys than little babies. Thank goodness the pudgy little hands aren’t gone yet — I’m clinging to those pudgy little hands, just a bit. And don’t feel bad…I have a perfectly good shawl I’m cheating on because I suddenly decided my daughter needed a sweater… The shawl is almost done, too. We’ll get there eventually! I’m sure Elliot has a sweater or two to keep him warm while you knit the new one. And I don’t blame you for being seduced by that cowl — it’s stunning! What a gorgeous sweater, Ken! Elliot obviously loves it. Perhaps you should knit the sweater one size larger than you were planning. Thank you, Ken, for implicitly OK’ing my decision to clothe my two-year-old niece in what for a moment felt like ridiculously nice yarn. OMG doesn’t he look like his mom! I watched your daughters grow up. I watched your nephew grow up. Now your grandson is…well… I’m getting old. Great that Ken has Elliot’s back. Literally . 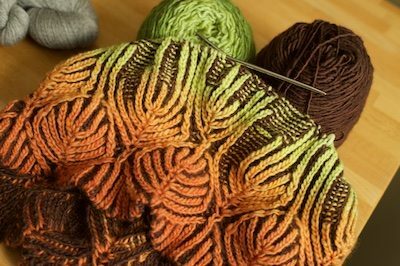 Knitting often seems to exemplify the modified saying, “knit is what happens when you make plans!” Nothing is totally lost, though….you have a completed project. Lovely cowl. 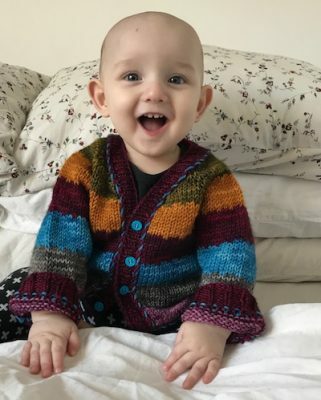 Ken steps up with an adorable sweater for adorable Elliot! Nicely done, and love that you added the braid trim. Well played, Ken. She’s giving you the cowl, right? How cute can Elliot get? Oh my goodness. Love his smile! That picture really made my day – what a sweetie! I can’t believe it though, he’s already looking like a toddler! How does that happen so quickly!?! For the first time, I looked at an Elliott pic and could see the little boy there lurking behind the baby. So what you did is notice that Ken had made a beautiful sweater for your darling grandson, and you were so pleased with Ken and so tender of his feelings that you put down the sweater YOU’RE knitting while Ken gets to bask in pictures of Elliot in HIS sweater. You’re still going to finish the sweater you’ve got on the needles, but not until Ken has had a chance to feel really appreciated for his hard knitterly work. It’s just about being a good friend, you know? What a relief! That child will never be cold with all the knitter love that surrounds him. I would love it if you would come to Maine or close to Maine and teach a class in brioche. Or just teach it somewhere and I will come to WHEREVER THE HELL YOU ARE. I cannot do this stitch. I need massive intervention. And Elliot gets more adorable every day. The cowl is absolutely gorgeous and Elliott has an adorable sweater, although not from you. All is perfect in my book. I don’t think that little guy (who is quickly becoming a big guy) will ever want for anythink knitted. A lot of people have his back. Oh, for Gosh sake’s, come to Winnipeg! I know it’s miserable right now but it gets lovely about May and June! Please, pretty-please? Gorgeous cowl, and Ken, awesome sweater. And Grandma? Awesome grandson/model. 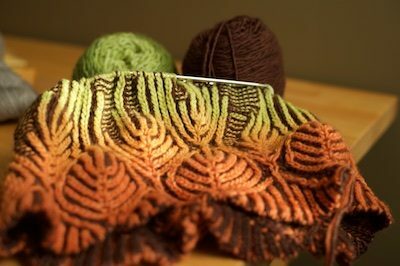 Stuff happens – the cowl is gorgeous – I always love the colorways you choose. Which brings me to my question: Have you ever chosen colors, knit them up, then thought, “I really hate these colors together.”? ps – what a lucky child! Funny how that project thing works out. Precious boy in a great sweater. Grands are just the best. Full. Stop. Sheesh. Nothing illustrates the passage of time quite like baby teeth! That smile! That’s one well-dressed little man. Well done, Ken, and that cowl rocks, Stephanie. Sometimes you just need to recharge your batteries with the yarn that grabs you the most right at that moment. That sweet baby face lights up the whole room! He is so delightfully bald! Ken’s sweater is beautiful and will keep him warm until yours is finished. And the little one will be perfect for that next baby shower you get invited to. I always keep a few finished baby things in a drawer for the last minute baby shower. The cowl is beautiful. You have plenty of yarn left. you could do a second one with the colors reversed…. I teach a class in Brioche from time to time and I gave 7 Brioche cowls for Christmas last year, so… I can do Brioche. But I do not enjoy it. I do enjoy baby sweaters, so i would have the reverse problem. He looks so adorable! I love the blue accent sticking, I don’t think I’ve seen anyone do that before, looks great. I was in the Edmonton airport recently and my knitting was flagged by security for the first time ever. My heart sank at the thought they’d take it away from me….but it was a trainee who was not familiar with needles. The trainer simply took it out of my bag and showed him it was an okay object to let through. Thank goodness. I was working on your Lorne’s Hat with the Fleece Artist National Parks yarn…did not want to lose that! I love that cowl….looking for another to knit and that just might be it. And I love the baby (and the sweater). Super sweet! that cowl is beautiful, and definitely calls into the irresistible knitting category. I keep thinking he can’t get any cuter — then you post a new picture!!! That face, that smily face!!!! Melts me every time!~! I hope you’re knitting that for you as those colors are so you!